● Steam comes out from under the hood. Follow the correction procedure as described below. 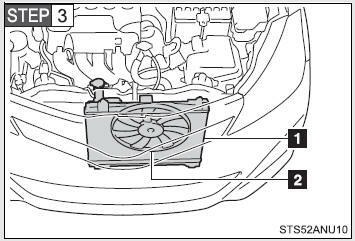 Start the engine and turn the air conditioning system on to check that the radiator cooling fan operates and to check for coolant leaks from the radiator or hoses. ●Keep hands and clothing (especially a tie, a scarf or a muffler) away from the fans and belts. Failure to do so may cause the hands or clothing to be caught, resulting in serious injury. 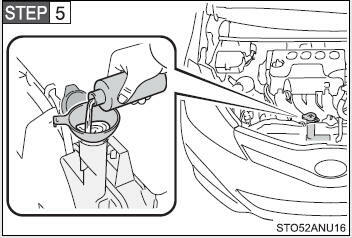 ●Do not loosen the radiator cap and the coolant reservoir cap while the engine and radiator are hot. Wait until the engine has cooled down before adding engine coolant. When adding coolant, do so slowly. 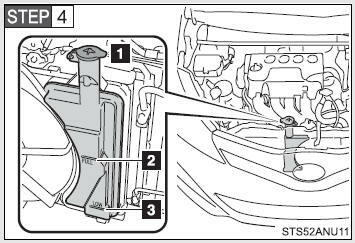 Adding cool coolant to a hot engine too quickly can cause damage to the engine. ●Avoid contaminating the coolant with foreign matter (such as sand or dust etc.). ●Do not use commercially available coolant additives.